Well, we’re just past the halfway point finally! Sweetgeorgia is an incredible local dyer whom we are always just thrilled to be able to work with. Colours are always on point, and they make some of the best possible choices for base yarns. 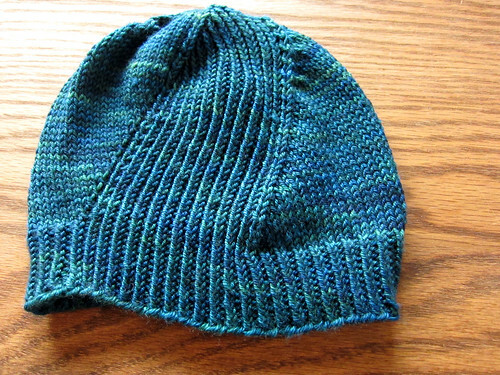 Case in point, I just finished a quick little hat in in their Trinity Worsted (70% Merino, 20% Cashmere, 10% Silk) and it just might have been the nicest worsted weight yarn I’ve have the privilege to use in a long time. Pattern is Windschief, by Stephen West. This entry was posted on Saturday, December 13th, 2014 at 2:44 pm	and is filed under Advent. You can follow any responses to this entry through the RSS 2.0 feed. Both comments and pings are currently closed.